The rematch of Wladimir Klitschko and Tyson Fury has been cancelled due to Fury’s medical condition. According to Fury’s promoter Mick Hennessy, Fury was “declared medically unfit to fight.” At the time Hennessy made this statement, he did not disclose the medical concern. However, it was later revealed that the issue was Fury’s mental health. Fury defeated Klitschko on November 28, 2015 and won world heavyweight titles from the WBA, IBF, WBO, and IBO. Klitschko had been a world champion for many years and the loss to Fury was Klitschko’s first since 2004. In spite of the historic win by Fury, he has not been as celebrated as he anticipated. Fury had the height, reach, and age advantages against Klitschko. Fury won by unanimous decision, but his reign as a world champion may be coming to an end without a title defense. The IBF title was stripped from Fury about two weeks after he defeated Klitschko because he signed a contract to fight Klitschko in a rematch instead of facing Vyacheslav Glazkov who was the IBF’s mandatory challenger for its world heavyweight title. As a result, Glazkov fought Charles Martin for the vacant IBF title. Martin defeated Glazkov by TKO and won the vacant IBF title. Martin’s first title defense was against Anthony Joshua. Joshua won by KO against Martin. Joshua is still the IBF heavyweight champion. Joshua and Fury are both from the United Kingdom. Klitschko is from Ukraine. Fury was originally scheduled to fight Klitschko in July, but the fight was postponed due to Fury having an ankle injury. The fight was then rescheduled for October 29, but it is now cancelled in light of the recent news about Fury’s mental condition. It has been reported that Fury has suffered from depression. Klitschko made a statement on video in response to Fury pulling out of the rematch again: “As you already know, October 29th revenge against Fury is cancelled due to whatever issue this time Fury has. Screw it. I will move forward and I will keep you posted when and against whom my next fight is going to be staged. I will rely on information from the sanctioning bodies how they will move on with the titles that currently Fury has. I will keep you posted.” He probably does not need to. We will surely know if and when one or more of the sanctioning bodies chooses to strip Fury of the title(s). The WBA and WBO may strip Fury of their titles if he is inactive for more than one year which will be in a couple of months because he last fought in November 2015. 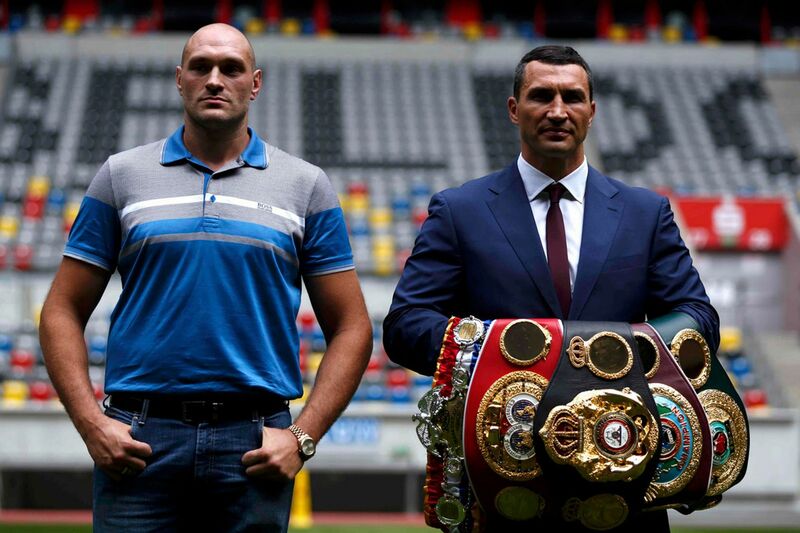 If Fury is stripped, then the WBA and WBO titles would become vacant. Fury is receiving no sympathy from Klitschko or WBC heavyweight champion Deontay Wilder of the United States. Wilder stated on Twitter that it is sad to see a champion unfit to perform due to no self discipline. Wilder seems to think that Fury is not in the proper physical condition due to lack of training. However, Klitschko is definitely in shape and Fury would have likely lost if he was not at his best physically and mentally for the rematch. History probably would have repeated itself if the Klitschko vs. Fury rematch occurred. In February 1978, Leon Spinks defeated Muhammad Ali by split decision and won the WBC and WBA world heavyweight titles. Ali was an aging champion who was not fully prepared for Spinks who was younger and in his prime. Spinks also trained harder than Ali. Ali was much more motivated in his training for the rematch which was seven months later in September 1978. Spinks did not seem to be as physically prepared as he was in their first fight. Ali won the rematch by unanimous decision which was the last win of his pro career. Spinks beat a legend in Ali, but his glory was short lived. It is probable that the same thing would have happened to Fury if he did not pull out of the rematch. Fame can be fleeting and there are other challengers besides Klitschko who are very capable of defeating Fury if they had a shot at his titles. Fury may have no titles left by December if the sanctioning bodies strip him after a year of inactivity. If the WBA and WBO strip Fury of their titles, it is likely that the IBO will too because they want to continue collecting sanctioning fees and it is unclear when Fury will return to the ring. Fury may never return and could retire. He has talked about retiring before, so this would not be unexpected. In 1994, Lennox Lewis agreed to fight Riddick Bowe the following year. Nevertheless, Lewis first had to defeat Oliver McCall in a mandatory defense of his WBC heavyweight title. Lewis may have been focused on his future opponent Bowe rather than on McCall. McCall won by TKO and Lewis had his first pro defeat. The rematch happened about three years later in 1997. It was one of the most bizarre fights in boxing history. In the third round, McCall was being pummeled by Lewis. After the third round, McCall did not return to his corner. In round four, McCall had his arms down and he was not defending himself. McCall walked around the ring. Lewis was so perplexed at McCall’s behavior that Lewis was not throwing punches even though he could have. Referee Mills Lane intervened and paused the fight to see if McCall was okay. He then allowed the fight to continue, but McCall was still acting strange. After the fourth round, McCall again walked around and did not return to his corner. In round five, Lewis was doing all the punching and McCall was content to just try to defend himself occasionally. After McCall walked away from Lewis, Mills Lane had seen enough. This time, Lewis defeated McCall by TKO after Lane stopped the fight. McCall then cried. It was obvious that someone in that mental condition should not have been permitted to fight, but the fight could not have been cancelled unless it was known that there was a problem. McCall was able to recover and fought for many more years until 2014. People will question if Fury can overcome his mental condition and if he will continue to fight. Some people live with depression all their lives and it can be a chronic disease that never goes away completely. There are people who have dysthymia which is a mild depression, but it can still have an adverse effect on people’s lives. The sanctioning bodies will probably wait before making any decision on Fury’s status as world champion. Any impulsive decision now against Fury would seem insensitive considering the circumstances. However, eventually the show must go on. Klitschko deserves a title shot soon, but it is not going to be easy for Klitschko to win against the other world champions. Joshua and Wilder are undefeated and in their primes. Even though Fury is the WBA “super” heavyweight champion, Luis Ortiz who is originally from Cuba is the interim WBA heavyweight champion. Ortiz is 37 years old, but he is an undefeated southpaw with knockout power. Klitschko could fight WBC Silver heavyweight champion Alexander Povetkin of Russia, but this is considered to be a minor title and Klitschko may only want belts of the highest level. Klitschko defeated Povetkin by unanimous decision in 2013. Critics of Klitschko have waited for the day that he would be dethroned. The vanquisher of the 40-year-old Klitschko also has his critics. Fury may not get a rematch against Klitschko if he comes back. Klitschko may be retired by then. Klitschko may lose to one of the other world champions. Perhaps the fans will get what they want and we will see all the world titles unified. A tournament involving WBC champ Wilder, IBF champ Joshua, interim WBA champ Ortiz, and former champ Klitschko would create a lot of interest. If this were to happen, the WBO and IBO would probably want to be involved as well. In a couple of months, the sanctioning bodies would be within their right to strip Fury due to inactivity. The WBA would probably want their “super” world title that Fury has to be involved in a unification tournament too. Will the WBA elevate Ortiz from interim to “super” champion? Will any of the sanctioning bodies allow Fury to remain a world champion when he has more than a year of inactivity at the end of November? It will be interesting to see what happens. Fury has publicly stated that he is motivated to box solely for the money and that he hates training. When a world champion shares views like that with the world, he is going to have critics. For now though, the usually talkative Fury is silent. We know based on what he said in the past that his fury, his passion for boxing, is also silent.